There are often serious difficulties in establishing with accuracy what had been the name of certain railway stations. On the Underground, one of the more troublesome examples is that station known today as Gloucester Road. I would not care to say with certainty what its correct name was during its first forty years. Brompton? Brompton-Gloucester Road? Gloucester Road-Brompton? Gloucester Road? Glo'ster Road? Or was it some other combination of these names, with varying combinations of brackets, commas or hyphens? Indeed, it begs the question about what 'correct' name actually means. Is it the name on the signs, the tickets, the timetables, the official government returns? Even these clues assist us little when we see differing names on station signs, and different names on tickets sold the same day; timetables are also inconsistent in their spelling, sometimes in different places in the same edition. Fortunately, profound variation and inconsistency is confined to a relatively small number of stations and where this is important the histories that need to refer to them can explain all this. I mention the problem of identifying 'correctness' generally, simply to show that what is 'right' or 'wrong' can sometimes be a matter that is not so easy to establish and that to claim there is but one definitive name is perilous and glosses over a more interesting and informative background. What I seek to do in this essay is to go into one small area of this, which is the deployment of the apostrophe in certain District Railway station names. The first station to attract my attention is what today we call St James's Park. The evidence, such as it is, suggests that when opened in 1868 this was also the name of the station, and so it remained for some years. Evidence includes several 'official' maps of the District Railway during the 1870s and engineers' drawings of about 1866 origin. However, there later began a practice of omitting the final 'S'. It is difficult to put a date on this but staff timetables show the name in this reduced form as early as 1884 and other indications suggest that it was common during the 1890s and (as far as I can see) pretty universal by the time of electrification. 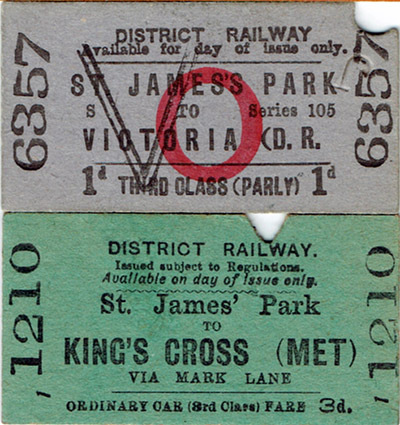 Above are two District tickets, the top one 1880s (with apostrophe s) and the lower one just after electrification (after the dropping of the final s). On the right is a view of the westbound platform at St James's Park around the mid 1890s. Visible at left are (for some reason) two station nameboards, the one of the left displaying apostrophe s and the one to its right omitting it. Presumably the one on the left is somewhat older. Above are two maps, the first around 1900, without final s, and the other one an Underground diagram roughly half a century later. The Underground diagram not only omits the final s but drops the apostrophe too. The above pictures illustrate exterior shots outside or near the station. On left are signs at west end of Dacre Street in July 1898. In centre is the Palmer Street entrance in 1916. At right is the main entrance in September 1952. 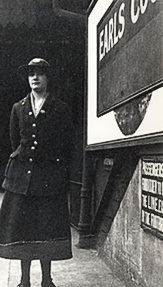 All end with the apostrophe but without a following s.
On the left is a photo of one of the station bullseye signs of the type installed 1922-24 and integral with the flat enamel plate attached to the wall. 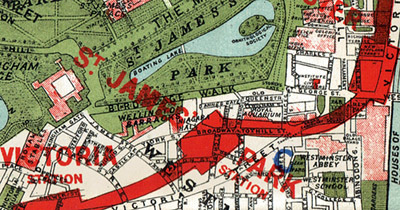 This uses the version with apostrophe but without a following s. On the right is a London Transport ticket circa 1950 and omitting both apostrophe as well as following s.
You can see from these images that for half a century or more the evidence suggests, fairly consistently, that the 'official' station name was St James' Park, though the apostrophe was sometimes omitted altogether. The name survived the period during which it could hardly fail to have been subjected to the forensic scrutiny of Frank Pick who was evidently not troubled by it. It seems that in 1950 or thereabouts there was a change of heart. 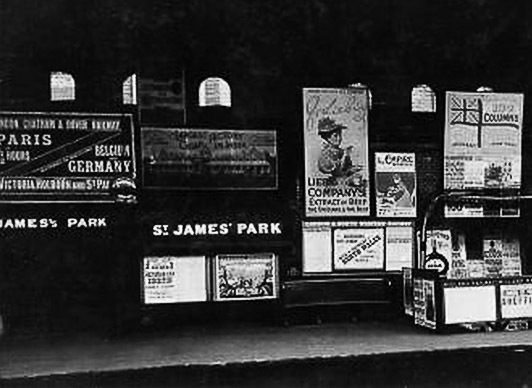 The station namesigns were plated over by new blue namebars reading St James's Park and maps, tickets and other publicity were quickly brought into line (one sign on the eastbound platform has in recent times had the bar removed and shows the unamended name. I gather this was deliberate in order to show a sign in original condition). The adjusted name appeared from the January 1951 Underground diagram. The station is obviously named after the nearby park, but how did the park become named? We can trace the name to St James the Less, to whom was dedicated a small leprosy hospital (an institution for fourteen leprous maidens) on a site half of a mile or so north-west of Westminster Abbey. Leprosy was sadly all too common after the Norman conquest and houses were constructed outside the town walls where those affected were confined in the belief this was necessary to avoid the disease spreading. This one was certainly in being by the year 1189. Under the hand of Henry VIII, this establishment became the site of a royal palace (which continued the association with St James) and the land to the south, which was emparked at the same time, also adopted the name, after the palace. The question arises as to why the final s in the name of the station was dropped for over 50 years in the first place. 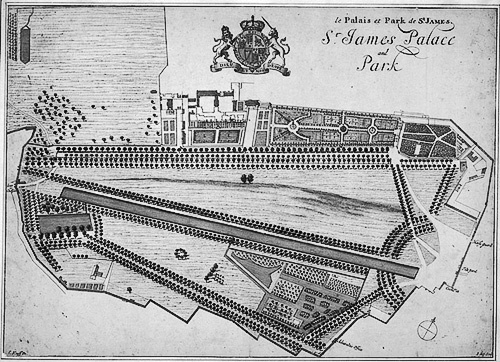 We all know that one of the main purposes of the apostrophe s is to represent the so-called possessive case, in this instance suggesting that St James's Park represents the Park of St James (more particularly it was the park of the palace of St James, which carried forward the dedication to that saint from the earlier hospital). 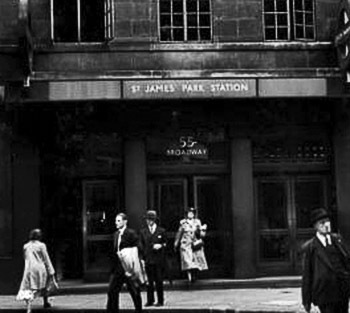 In any event the station was named after the park and by mid-Victorian times the usual spelling of the park was St James's. I cannot imagine in later Victorian times fighting amongst the grammarians about the correctness of any of this. 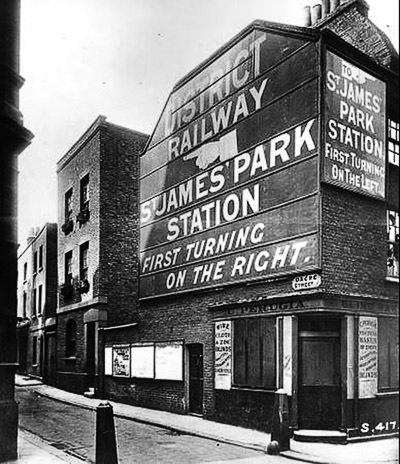 There is no doubt that the station name did alter to a consistent James' spelling in or around the 1890s and this was most likely the result of someone disliking the fussy spelling of a name some pronounce as "James-ez", but by no means everyone. 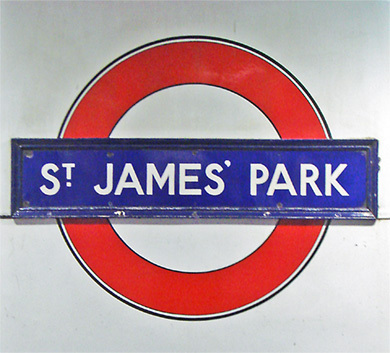 Some just say 'Saint James Park' irrespective of the spelling. At this point you may care to note the plan of park, above, c1707, before the apostrophe had caught on. Since the apostrophe is a relatively recent innovation I suppose we are entitled to ask how the name of the area was pronounced before the apostrophe s was added. Since we know that very old, pre-apostrophe maps print the name simply as 'James', I suppose that was how it was pronounced a couple of hundred years ago. Should we change the way the name is pronounced in more recent times, just because of a codification of the use of the apostrophe as a written indicator of meaning (only in special cases, such as words ending in s, would the question of sounding an apostrophe arise)? But many people have: "James-ez" is a common way of pronouncing the place. This creates the circular argument, that if it is pronounced "James-ez" then it must be spelt "James's". Well, someone working for the District Railway 120 years ago was happy to ditch the final s and presumably did so because it was not felt necessary.. But to omit the final s is wrong, some will say. Is it? And who says? Well, for the station name to last without the final s for half a century or more would seem to me weak evidence for being 'wrong', taking the usual meaning of the word, though for the spelling to be out of correspondence with that of the adjacent park might be thought odd. Going into the subject, it seems evident that the process of gaining consistency in the way the apostrophe is deployed in written English was not really complete until the middle of the nineteenth century and although there is general acceptance for most of the 'rules' which we still use there are instances where complete agreement has not been obtained. The Oxford Companion to the English Language laments that there never was a golden age when the apostrophe was used with consistency and notes that one of the troublesome areas is where singular nouns end with a sybillic (strongly sounded) s. Several authorities and numerous style guides fully recognize there is a 'problem' but vary as to how to deal with it. There are those that say add apostrophe s as with any other noun. Others say add only an apostrophe (with no final s) in the case of proper nouns, othewise as normal. I have examples to hand recommending the final s should be omitted where it would not normally be voiced, with a variant where this only applies to longer words. Some would omit the final s only with certain words 'of antiquity', the name Jesus being an example. None condemns the alternative possibilities as they all recognize there appears to be an issue, and each strives merely for consistency. My copy of Fowler's English Usage (from 1965) acknowledges it was once common, where a noun ended in s, simply to add an apostrophe, but was now less so. I make these observations merely to suggest that to say that those who claim the use of the form "James' Park" is actually wrong are probably on thin ice but that fashions have changed. Somehow I doubt I will find an answer to exactly why our late Victorian forebears uniformly selected this form, and I am not sure we will discover why at some expense the spelling was changed in 1951. If the apostrophe s in St James's Park is problematic, it is naught compared with the inconsistencies in usage of an apostrophe in Earls Court. 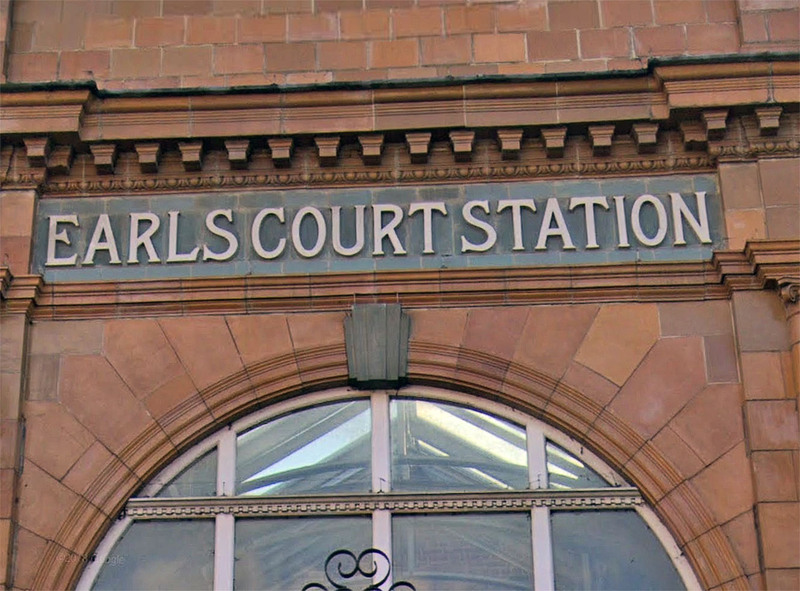 The problem at Earls Court was not especially of the District's making since the area itself observes Earls Court spelt both with and without an apostrophe s, with notable inconsistency, and has done for a century or more. The Ordnance Survey (the government's mapping agency, or OS) mapped the area at around the time the District was built and adopted the spelling that included the apostrophe. The OS always tried to record names correctly but as language was spoken and written records were not necessarily plentiful (nor themselves accurate and consistent) this could be difficult. What, anyway, would be a 'correct' place name, let alone a 'correct' spelling, particularly of somewhere of little importance (the Earls Court area was virtually undeveloped in the 1850s and early 1860s). 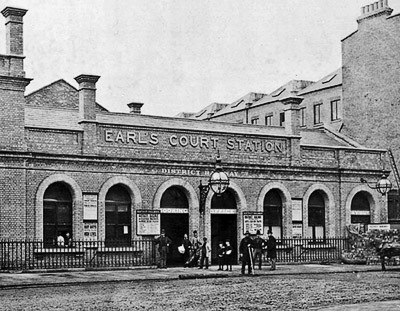 Earls Court is located in Kensington and the earl being referred to is the earl of Oxford, who shortly after the conquest was lord of the manor of Kensington and whose court (manor house) happened to be near today's station building. It must be said that the manor had become detached from the earldom by 1610, so in the two and a half centuries between that date and the mapping of local names by the OS, the name Earls Court clung on by tradition (there being not much else in this thinly populated area to offer up an alternative name). The apostrophe had barely been introduced to Britain at the time the earl had moved on and its development was volatile and not deployed to any commonly understood standard until the end of this period either, so we can be fairly certain that the Earl's Court spelling variant cannot possibly have been in use while the earl was around. The earliest OS map I have noted using it is the 1850 town plan at 1:5280 scale (1 ft to the mile). There are earlier maps than those of the OS. A turnpike trust map of 1790 by R. Roberts shows this area in detail and Earls Court is shown with no apostrophe (see map to right), and neither does Cary's map of 1787. Nor does Rocque's map of 1761 (though he does not appear to use the apostrophe anywhere). Mogg's London in Miniature of 1806, Davies's post office map of London 1856 and Laurie's Map of London 1837 also shun the apostrophe. There were a few maps in early Victorian times where the apostrophe can be found but it is apparent that it was first used consistently by the OS and this would have given it a certain authority (whether warranted or not). It is perhaps of interest that the plans deposited with Parliament for obtaining the District's 1864 Act show the Earls Court area without use of apostrophe. I do not know who produced the base map upon which the railway was superimposed. 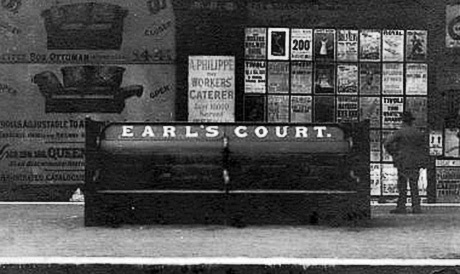 I doubt if many people had heard of Earls Court until the District Railway arrived in 1871 and we cannot now be certain how that company spelt the name since (as far as I know) no photographs exist that show the original station (which was on the east side of Earls Court Road). When the station moved over the road to the west side in 1878, the name outside and the platform signs included the apostrophe. Whether this was influenced by OS mapping practice or not we do not know. The 1883 staff timetable uses the apostrophe, but not that in 1901. On the other hand, District maps of varying periods from 1871 to the period of electrification do not include the apostrophe, make of that what you will. The images below show an 1871 map (no apostrophe), an 1890s photo showing the building including one and a late Victorian platform view showing a seat sign with the apostrophe. When the station was rebuilt in 1905 the external name (fired into the tilework) did not include an apostrophe, and neither did the platform names of the Piccadilly platforms when opened the following year. 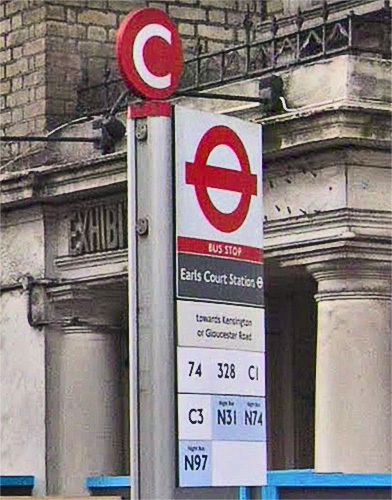 Indeed, with one or two inexplicable exceptions, it seems that all signage installed throughout the rest of the District's life, and extending throughout the 1950s, also omitted the apostrophe, including all the standard London Transport bullseye signs first installed during Frank Pick's reign. I cannot possibly identify any one specific cause of this, beyond the obvious one that, prior to the twentieth century, usage was inconsistent and someone attempted to standardize the spelling and saw no compelling reason to insert an apostrophe. As at St James's Park, the fact that the 'Earls Court' spelling was pretty consistent for sixty years and didn't give rise to rioting in the streets seems evidence enough that it was not causing anyone a problem. The no-apostrophe spelling carried across to posters and the Underground diagram and most other publicity produced by the organization. The above images show various presentations of the name from 1905 and later where it is used consistently with no apostrophe. 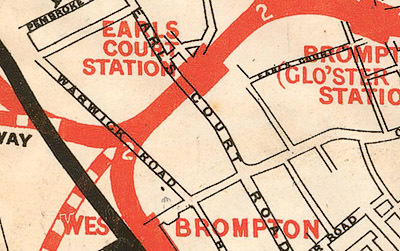 The 1951 Underground diagram gifted Earls Court with an apostrophe and as with the spelling change at St James's Park, there was limited follow through with publicity items such as posters and timetables. There was no immediate move to change the station nameboards. However in the early 1960s (I am led to believe 1962) most of the signs at Earls Court were replaced overnight, or plated over with a similar one including the apostrophe. The enormous running-in boards at the east end were not altered (and have remained unaltered) probably because it would have involved a track possession at the time. Exactly why this expensive exercise was embarked upon I do not know for sure, but I am led to believe it was at the instigation of Michael Robbins who seemed to have a problem with the name being presented as it was. He was then Chief Commercial and Public Relations Officer. Today, therefore, the station name has an apostrophe wherever it is employed. You will see that the station has now enjoyed a period of continuous apostrophe use that matches the similar, previous, period when it was consistently not used. There are always going to be some oddities and in the case of Earls Court it was the tickets. For some strange reason apostrophes were not added to ticket names, either in 1951 or after the signs were changed in 1962. Here is a 1966 ticket from the station but the lack of apostrophe continued into yellow ticket days. 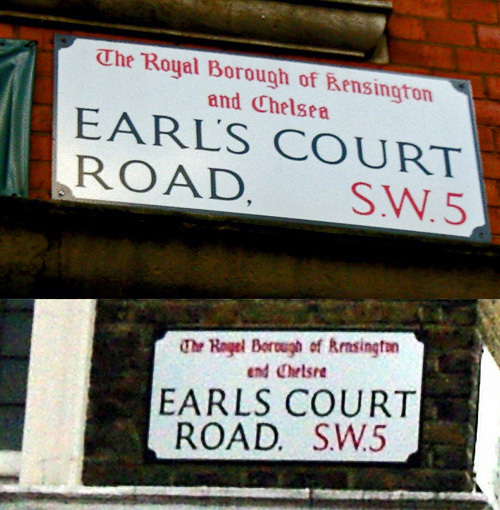 Kensington (later Kensington & Chelsea) council appears to have an inconsistent approach to the name which has varied over time. I still cannot tell what the preferred version is. Examples above. Of course, this uncertainty is then transmitted throughout the community, which uses both variations of the name. The exhibition hall invariably spelt name without apostrophe, which perhaps influenced usage until its sad demoltion recently. It appears London Buses is unimpressed by the Underground's use of the apostrophe and chooses not to acknowlege the apostrophe itself when referring to the station. The apostrophe in bus destination blinds for Earls Court has for many years been absent but over last 25 years or so appears much more frequently but still inconsistently. On the basis of all this it would be rash to say that TfL has a discernable policy, or perhaps it has but the staff and contractors are not clear what it is. London Transport latterly had a practice (policy is much too grand a word) for Underground use but less obviously so for buses, whilst LT in earlier years (and the Underground before it) had for an equal number of years adopted the opposite practice. Make of this what you will. You will notice I do not write Earls Court with an apostrophe. This is in part because I do not see that apostrophes in well established place names serve much purpose (see shortly for the problems they cause) but more particularly I tend to spell using Oxford practice and my copy of the OUP style guide (known as Hart's Rules) explicitly commands Earls Court not be given an apostrophe. That's good enough for me. Here we have some more challenges. 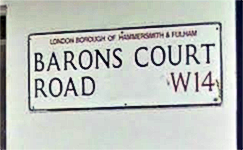 The station was named after the adjacent Barons Court estate, which lies to the east of the station and was developed by Sir William Palliser. I cannot be certain beyond all doubt that the estate did not have an apostrophe in it but unless anyone knows better I am supposing that the instrument of development was Barons Court Ltd. Both Board of Trade recorded title and London Gazette record of striking off (in 1930) have the name without an apostrophe. Having said that, there are countervailing arguments for suggesting the apostrophe was used, such as advertisements for estate property, the usage in the contemporary history 'Fulham old and New' (1900) and the name of the road comprising the Northern spine. 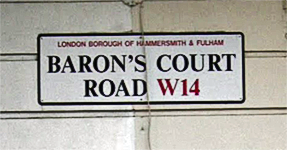 The ordnance Survey would have us think this has always been Baron's Court Road, and this is the name given in the 1902 Post Office Guide and in the London County Council's list of streets from 1928. Moreover it is what most of the street signs claim (it is too much to hope this would be all of them). However, we are speaking of a station built by the District Railway, and since I believe it to be settled territory that by 1905 the District did not care for apostrophes, I am not sure the company was bothered whether the estate used one or not: either way it was not District practice and nobody seems to have been bothered. 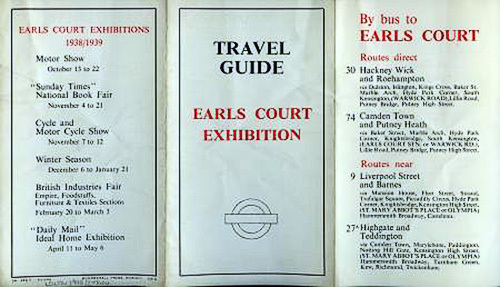 The matter is unlikely to have been reviewed until the London Transport purists were awoken in 1950 and evidently concluded that Earls's Court should have one but Barons Court need not. I won't weary readers with any more about Earl's Court but a quick review about the Barons Court position is probably called for, and how the outcome seems a bit peculiar. It is the more peculiar in that both stations were named after nearby physical properties and the only difference between them is that one was several hundred years old and the other very much newer. Why not treat them the same way? Of course, today, we see all around us great huffing and fussing about very old things without giving a care to anything current (though 'current' will become old one day, if it survives) so therein might lie the answer — Earls Court was 'historical' while Barons Could didn't matter. If that is not the answer, are we supposed to conclude that sensible London Transport Officers have actually wasted time exhaustively examining the complete etymology of both names? Seems unlikely. The Earls Court story I have given already. 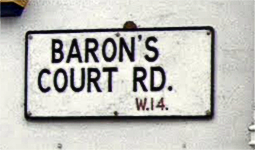 All I know about the name Barons Court is that most derivations are highly speculative. For example one such unsubstantiated story relates to it being named after Palliser's Irish Estates. What estates are these then? There is a remotely-linked estate, Castletown (in Wexford), after which one of the roads is named, so it isn't that. Several sources, all identical in their fatuous wording, suggest it was named after Baronscourt, a vast estate in Tyrone (Northern) Ireland. This is nowhere near where Palliser came from and there appears to be no connection whatever. The parish status Baronscourt estate is that of the Duke of Abercorn who also appears to have had no connection whatsoever with the Fulham area (except that certain of the lowest class of online genealogy sources claim the first duke died in Baron Court, Fulham, when in fact it was his ancestral home, Baronscourt, in Ireland). Nor is the theory it is related to the Court Baron of the manor of Fulham very convincing, the lord being the Bishop of London, based in his palace near the Thames. Why would the estate be named after that? The palace is 1½ miles away, hard by Fulham village, yet Palliser's estate is build on agricultural land remote from anything much, bar North End which is ill-located from the centre of Fulham affairs. 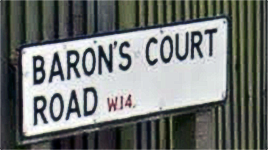 Unless someone can demonstate the Court Baron was regularly held near West Kensington (which is not in Kensington), then I go for the theory that in the absence of any topographical feature to name it after, it was simply found an amusing name to give a large estate that sat in contrast to Earls Court on the other side of the West London Extension Railway and about as far removed from it. If that be the case then perhaps they should have the same number of apostrophes in their respective names! Almost for amusement I show below the current OS large scale plan for Barons Court station. Yes, it has an apostrophe in it, and I find all OS plans of the station over the last century have it. Further evidence, if needed, that the OS is not to be trusted as a reliable source of apostrophe usage. Observations about two stations, St James's Park and Earls Court, are given because the District Railway vacillated about their spelling and eventually determined a consistent approach which in neither case accords with expected current practice. The only other station they owned that invites question is Parsons Green. Lysons' Environs of London (1795) states that the name arises from its proximity to the parsonage house (long since disappeared) in which was ensconsed the rector of Fulham. Lysons asserts an alternative but less well known name of Parsonage Green. I am not at all sure that this derivation is materially different from that of Earls Court — both places are ostensibly named after an office-holder's property. Curiously the OS also blessed the place with an apostrophe, visible on the 1894 1:1056 large scale plan, but then seems to have thought better of it, as it is omitted on the 1950 equivalent. Anyway the District was never inclined to use the apostrophe here and neither did London Transport. I suppose it is worth pointing out that the Underground group, and then London Transport, do seem to have had an aversion to the apostrophe and if one looks at Beck's first diagram, not one station has an apostrophe in it. This is not a Beck 'thing', for the station nameboards shunned apostrophes as did other publicity material, and Stingemore's earlier diagrams did not use them either. At least policy was clear. What is odd are the 1951 changes. 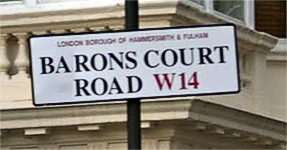 Aside from the St James's Park issue, apostrophes appeared in the names Earl's Court, Collier's Wood, King's Cross, Shepherd's Bush, St Paul's and St John's Wood too. This change was quickly reflected in other publicity, but at that stage it does not seem that signs were altered. Other than Barons Court, already dealt with, stations that were not altered were: Rayners Lane, Parsons Green, Golders Green, Canons Park and Bounds Green. In each instance there was at least an arguable case for employing an apostrophe, some having a stronger case than others. Of all these, the name Golder's Green was used on early Underground publicity but the apostrophe was lost around 1912 and never reappeared. The Central London Railway used apostrophes in Shepherd's Bush and Queen's Road but acquisition by the Underground Group quickly put a stop to it. The Met had only two opportunities, at Rayners Lane and St John's Wood and came up with a different approach in each case (though early inconsistency is observed). Why, is not apparent. 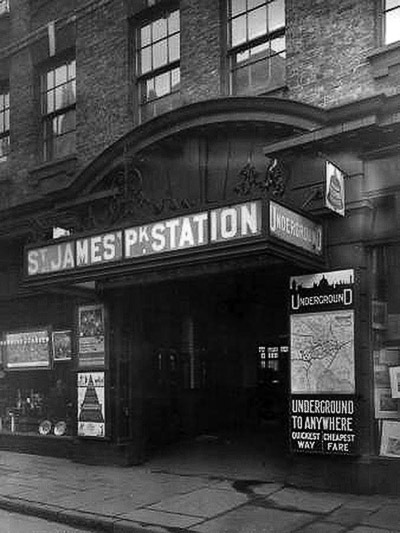 It remained St John's Wood until London Transport got its hands on the place and the new station was also built with with signage omitting the apostrophe. Today it is peculiar in that it bears an apostrophe on the diagram but (I think all) platform signs omit it as it is a heritage station and signs are in 1930s style. This all seems rather messy. It is also, I think, potentially rather inconvenient. In these electronic days the fact of a name change having happened, or of inconsistent use of apostrophes, does actually come at a price. With either people or computers word-searching documents and databases, the consistent use of spelling is crucial or you will miss what you are looking for. By way of example you can go to the LT Museum's photographic database and try looking up St James Park, St James' Park and St James's Park. The numbers of images pulled out are respectively 228, 187 and 173 photos, but it is worse than that as some images in the 173 are not in the 228 selection. Moreover if you cut and paste the name you search on from a document you might get no images presented at all! This is because only the straight keyboard apostrophe is recognized and not the curly one (a superscript comma) that word processors employ. Sorry, this is hopeless! It is the same problem at Earls Court (and no doubt other stations). Check once more the LT Museum photos for Earls Court. Spelt with an apostrophe there are 97 entries and without there are 172 entries (with some in the 97 that are not in the 172). Again the problem it causes electronic systems needs to be considered and even TfL's journey planner seems preoccupied about the correct use of the apostrophe for the station name but not in the road name outside. This is not helpful and the issue must exist all over the place wherever a database is used. Some local councils have decided to drop apostrophes in place names because of the problem it causes the emergency services using electronic databases to plan the fastest route, often in bad light and in a hurry. If the database uses the apostrophe (or not) in a way the driver does not expect, there can be a problem. I mention all this as an extension to District Railway history as their (apparent) view that apostrophes were unnecessary in established place names is just beginning to gain traction again. I do not have an answer to what London Transport thought it was doing after the War in changing some but not others, and I am not sure, with the benefit of hindsight, whether what they have wished upon Londoners has ultimately been very helpful. If I get more information, I will certainly share it.